Q: What are the duties required in the ninth commandment? A: The duties required in the ninth commandment are the preserving and promoting of truth between man and man and the good name of our neighbor, . . . loving, desiring and rejoicing in their good name; . . . a ready receiving of a good report and unwillingness to admit of an evil report concerning them. seven that are an abomination to him: . . . There are many biblical passages confronting gossip. The witness of God against this sin is overwhelming. What is gossip? It is not necessarily false information. Slander is false. Gossip might include true information, and maybe that’s why gossip doesn’t always feel sinful. What makes it sin is, first and foremost, that God says it’s sin. But gossip spreads what can include accurate information to diminish another person. That is not how people behave when they are living in the power of the grace of God. Gossip is our dark moral fervor eagerly seeking gratification. Gossip makes us feel important and needed as we declare our judgments. It makes us feel included to know the inside scoop. It makes us feel powerful to cut someone else down to size, especially someone we are jealous of. It makes us feel righteous, even responsible, to pronounce someone else guilty. Gossip can feel good in multiple ways. But it is of the flesh, not of the Spirit. Adultery too is a serious sin, and one likely to be disciplined in a church. But I have never seen a church split over the sin of adultery. Gossip is a sin rarely disciplined but often more socially destructive than the sensational sins. I walked into Evan's room this morning and saw two walls covered in purple crayon. I googled "how to get crayon off of walls" and found WD-40 to be the most popular, so I tried it...and it worked! It's a magnificent thing: The only newly-originating life in the universe that comes in the image of God is Man. The only newly-originating life in the universe that lasts forever is Man. We are reminded that this decision not only protects women's health and reproductive freedom, but stands for a broader principle: that government should not intrude on our most private family matters. No, Mr. President, you are not protecting women; you are authorizing the destruction of 500,000 little women every year. No, Mr. President, you are not protecting reproductive freedom; you are authorizing the destruction of freedom for one million little human beings every year. No, Mr. President, killing our children is killing our children no matter how many times you call it a private family matter. You may say it is a private family matter over and over and over, and still they are dead. And we killed them. And you, would have it remain legal. 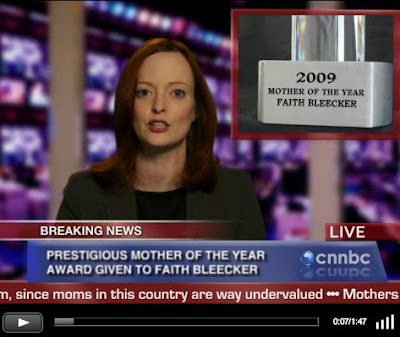 Faith Bleecker- Mother of the Year! I can't believe it! She won the Mother of the Year award! Check it out here. I read this on a blog I follow and laughed out loud. If you have had any experience with dogs and cats, you can probably appreciate this. 12:00 pm - Milk bones! My favorite thing! 5:00 pm - Dinner! My favorite thing! The only thing that keeps me going is my dream of escape. In an attempt to disgust them, I once again vomit on the carpet. Today I decapitated a mouse and dropped its headless body at their feet. I had hoped this would strike fear into their hearts, since it clearly demonstrates my capabilities. However, they merely made condescending comments about what a "good little hunter" I am. It is 7:21a and both of our boys are still asleep! So back to my excitement: Did you know that flowers are blooming outside? That the grass is turning green? My coffee tastes better and I had a skip in my step as I walked into the kitchen humming "O glorious day". I actually saw my wife smile this morning!! Jesus' return will be so glorious and so amazing, but this morning may be a close second. As you go, live unto Life.